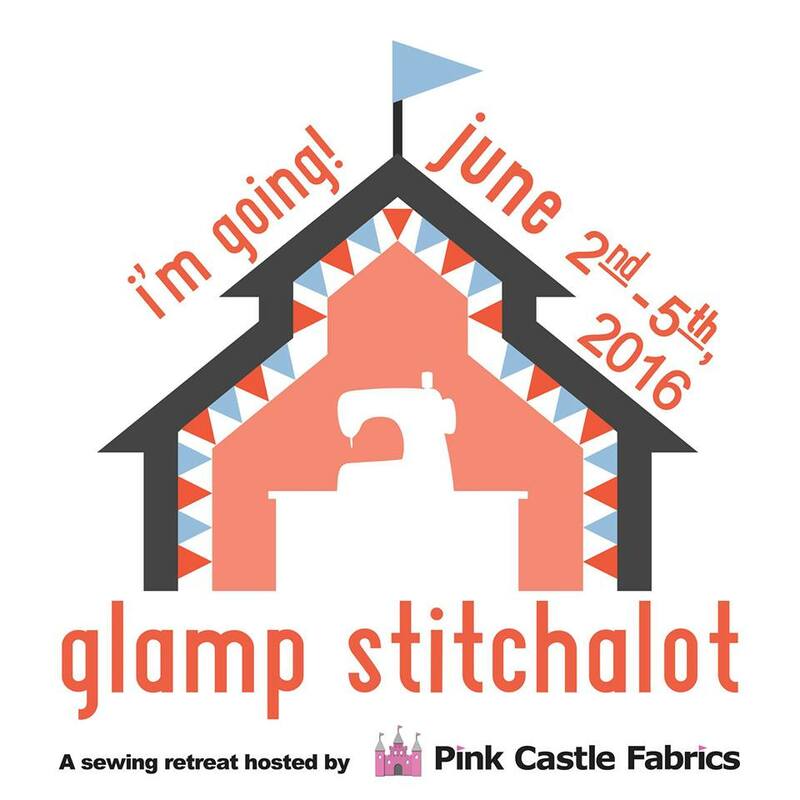 I'm so excited to be participating in this fabric swap, hosted by Leslie of Maze & Vale! Not only do I have an excuse to play around with printing on textiles, but I will also receive a hand printed fat quarter of fabric from each of the other four members of my group. I can't wait to start experimenting with my own designs... and to see what my group-mates come up with!! I haven't decided yet if I'll be screen printing, block printing, potato printing, or something else. In the meantime, I'd like to experiment with all of these methods. If you'd like to play around with printing on fabric, too, check out all the great resources on Leslie's blog. 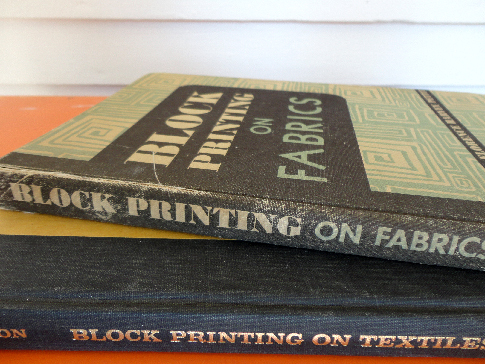 To make this all even better... after I told my friend Lori about the swap, she stopped by to drop off two books from the 1950s and 60s about block printing on fabric. I've really only had a chance to skim the books so far, but they seem fabulous and inspiring. I had to share some images from them with you. 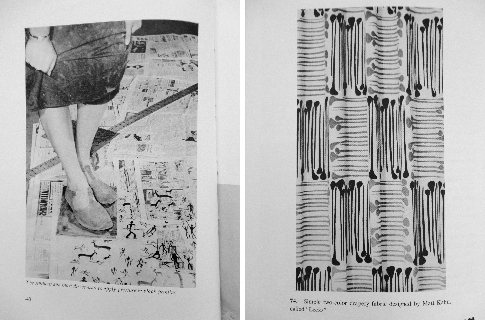 The image on the left reads: "The simplest and most direct way to apply pressure in block printing." And I love the two-color pattern on the right. A great illustration on the left; an inspiring modern sunburst graphic on the right. The only bad thing about all of this is that I need to wait to start on this project until next week! I have submissions due by Friday for a possible book project (Exciting! ), and am also preparing for one of my all time favorite craft fairs -- happening this Saturday. The Constructor Craft Fair is a little like a mini-Renegade. In addition to the amazing assortment of handmade goods, there is beer and food to be had, fun (sometimes-live) music, and the first fifty people in the door get a nifty swag bag. 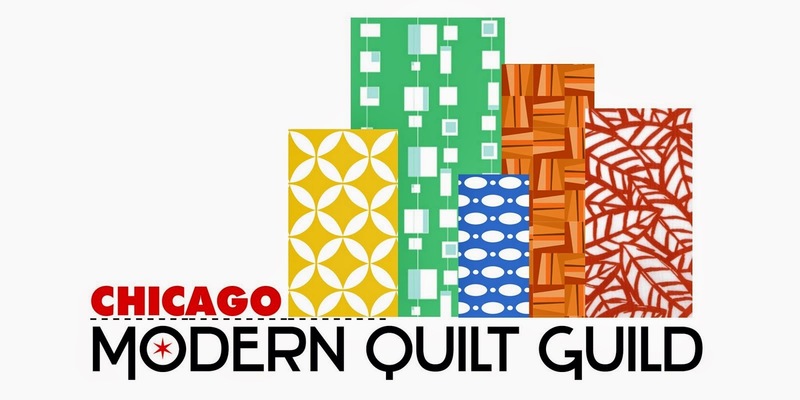 If you're in the Chicago area, I'd love to see you at Constructor. Stop by on Saturday and say "Hello!"